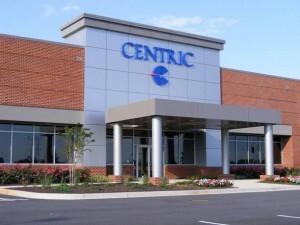 Located in Owings Mills, Maryland, Centric Business Systems is a 36,000 square foot, single story flex building with office and warehouse space. It is one of many buildings for which Fidelity Mechanical Services played a vital role in achieving LEED Gold Certification. After a comprehensive and in-depth energy and load analysis, Fidelity Mechanical Services determined that the best solution to condition the single story building was with systems utilizing Variable Refrigerant Flow (VRF) technologies. Results are summarized in Figure 1: Energy Consumption Profile. 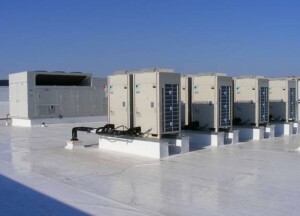 VRF uses refrigerant as the cooling / heating medium and allows one outdoor condensing unit to be connected to multiple indoor evaporators, each individually controllable by its user, while modulating the amount of refrigerant being sent to each evaporator. By operating at varying speeds, VRF units work only at the rate required to condition the space. Heat recovery VRF technology allows individual indoor units to heat or cool as required, while the compressor load benefits from the internal heat recovery. Energy savings of up to 50% are predicted over comparable unitary equipment. VRF systems also maintain a nearly constant room temperature without the typical temperature fluctuations that occur with a conventional on/off control system, ideal for a working office environment. Ventilation air is provided by a 100% Outdoor Air Energy Recovery Unit (ERV). The ERV is equipped with a total energy recovery wheel utilizing desiccant material for sensible and latent heat transfer from the outdoor air stream to the exhaust air stream. The ventilation system incorporates a demand ventilation control strategy which eliminates the risk of over-ventilating. This is accomplished by reducing the rate of ventilation airflow to match the occupant density while enhancing the indoor air quality. As a result, the total annual ventilation heating and cooling energy consumption is reduced by more than 30% and the total heating and cooling demand reduced by over 20%. A complete Schneider Electric web based Direct Digital Control (DDC) system is provided, which shall be fully integrated with software on the host computer via the base wide LAN. As a result of the energy efficient technologies used for this project, Fidelity Mechanical Services was successful in reducing the buildings HVAC energy consumption by nearly 50%. The reduction in energy qualified the project for more than $130,000 in rebates and incentives from the BGE Smart Energy Savers Programs – Custom Measures. In April of 2012, the project received the NAIOP Award of Excellence for Best Flex Building.